Increasing infrastructure projects coupled with increasing housing projects in Tier I and Tier II cities; the future of lighting fixtures market in India looks bright. The industry players are introducing high-end lighting fixtures in urban markets as a result of increasing demand for such products. Philips Lighting India, Bajaj Electrical Ltd, Crompton Greaves Ltd and Wipro Ltd are the market leaders in the lighting fixtures industry in India. According to a recent report titled ‘India Lighting Fixtures Market Forecast & Opportunities, 2018’, published by TechSci Research, the lighting fixture market in India is expected to grow at the CAGR of 17% during 2013-2018. TechSci Research analysts attribute this impressive growth rate to the increased number of construction projects across the country in the real estate and infrastructure sectors. The report mentions that the improving social infrastructure, automotive and IT sectors of the country are driving the lighting fixtures market in India in the right direction. The increasing government investment for rural electrification programs and expenditure on country’s infrastructure is also expected to contribute to the growth of lighting fixture market. ‘India Lighting Fixtures Market Forecast & Opportunities, 2018’ report also analyzes the lighting fixtures market. According to the report, the market for lighting fixtures includes portable and non-portable (fixed) lighting fixtures. The lighting fixture market is further segmented into consumer, decorative and outdoor lighting fixtures. The report also shares some important market trends. According to it, consumer lighting is the dominating segment in India, accounting for majority of the total lighting market. The penetration level of outdoor lights in India is expected to improve in the near future. Also, the increasing demand for LED and OLED lighting is contributing to the growth of lighting fixtures market. In addition, the TechSci Research report highlights the opportunities and challenges in the lighting fixtures market in India. According to the report light fixtures are being used as decorative items in high income households, which is fueling the niche market segment i.e. designer lighting fixtures market. “The industry players are introducing high-end lighting fixtures in urban markets as a result of increasing demand for such products. However, the demand for these fixtures is limited to urban households. The lower penetration level of decorative lights in India gives ample opportunities to the manufacturers to tap this growing market,” said Mr. Karan Chechi, Research Director, TechSci Research. 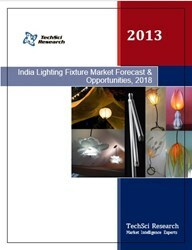 ‘India Lighting Fixture Market Forecast & Opportunities, 2018’ has evaluated the future growth potential of India’s lighting fixture market and provides statistics and information on market structure, statistics and trends. The report includes lighting fixture projections and demand forecasting. The report is intended to provide cutting-edge market intelligence and help decision makers to take sound investment evaluation. Besides, the report also identifies and analyzes the emerging trends along with essential drivers, challenges and opportunities available in lighting fixture market in India.